Sunday June 21 started out fantastic . . calm and sunny, and remained that way with only a gentle breeze developing during the afternoon. PERFECT weather . . 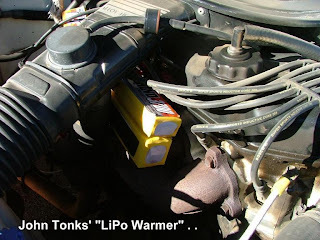 The morning was very cold, and Neil had his "LiPo Warmer" plugged into the generator to bring his packs up to about 30deg C. Yes . . this is the latest MUST HAVE accessory for high performance LiPo users. 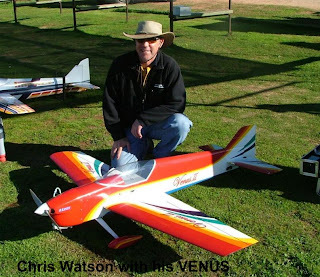 Just about all EP F3A pilots are adding a WAECO 12V food warmer to their equipment for cold weather flying. The pre-warming of packs significantly improves the performance particularly through the first 2 or 3 manouevres. Flying got under way with everybody enjoying the "kind" air. I was particularly enjoying it as all recent contests and practice have been in wind, and sometimes very strong wind, so this was a welcome change, and a breath of fresh air (pun intended). With all the flying and contests, the F3A guys were well rehearsed, and flying well. I personally felt I was flying the best I ever had, and the scores ended up proving that correct. 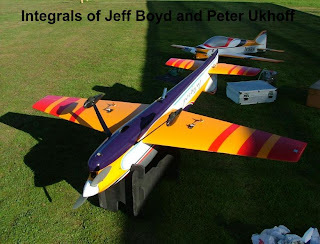 John Tonks and Neil Martin were also flying very well, so although tough, I was happy with the result. 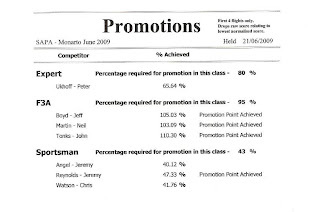 Third in F3A, but much closer . . AND . . achieved my last promo point in F3A, so now officially ranked as a F3A Masters pilot . . and a pretty damn proud one too ;o). The lone Expert pilot, Peter Ukhoff was also enjoying the calmer conditions. After lunch, he was trying a slightly different style following some discussions during lunch, and his schedule was looking much more solid with nice proportion. The competition between Jeremy Angel, Chris Watson and Jeremy Reynolds in the Sportsman class is hotting up a little more. After some engine woes in the first flight, Jeremy Angels' Impact came 'on song' for the remainder of the contest and was starting to look tidy. 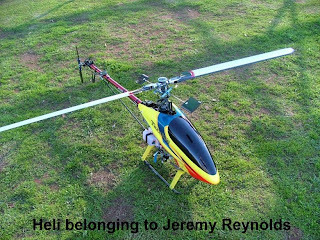 Chris Watson flew a solid event and finished 2nd, while Jeremy Reynolds and his Angel 50E topped the class with a fine performance gaining his last promotion point for the effort . . welcome to Advanced class, Jeremy :o) Jeremy Reynolds also brought out his neat Trex 600 heli for a "thrash" and has got a good grip on this discipline too . . starting to become a very accomplished alround pilot, Jeremy. At the end of the day . . we had a great contest in the best conditions for some time. The next contest is at Constellation Model Flying Club's field on July 26th 2009. Full results below . .